Talk about a powerhouse: every element of this recipe goes above and beyond in fitting in as much lush, decadent flavor as can be contained on a plate. 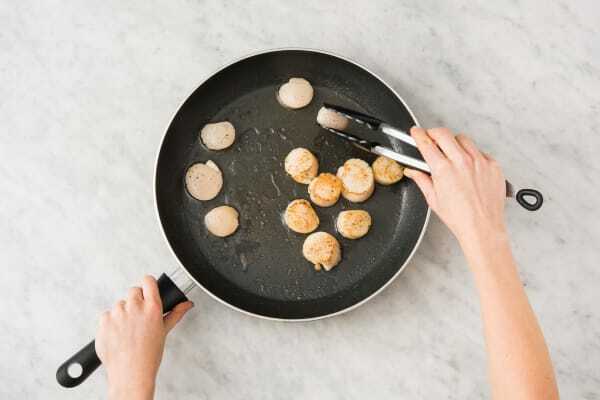 It starts with scallops, pan-seared until they’re gloriously golden and tender. They’re perched on top of a mushroom risotto, which has some seriously luxuriant overtones thanks to the addition of truffle oil. A drizzle of brown butter sauce ties everything together in nutty, rich splendor—one bite, and you’ll be hooked. Wash and dry all produce. Bring 5 cups water and stock concentrates to a boil in a medium pot. Once boiling, reduce heat to low. 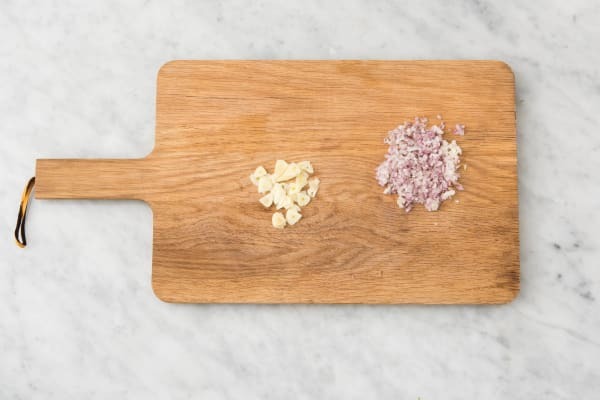 Meanwhile, slice garlic as thinly as possible. Halve, peel, and mince shallot. Heat a drizzle of oil in a large pan over medium heat. Add shallot and garlic. Cook, tossing, until softened, 1-2 minutes. Add rice and stir until translucent, 1-2 minutes. 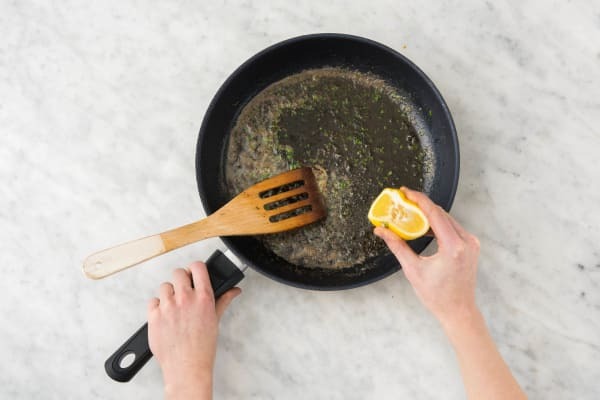 Add stock to pan ½ cup at a time, stirring after each addition. 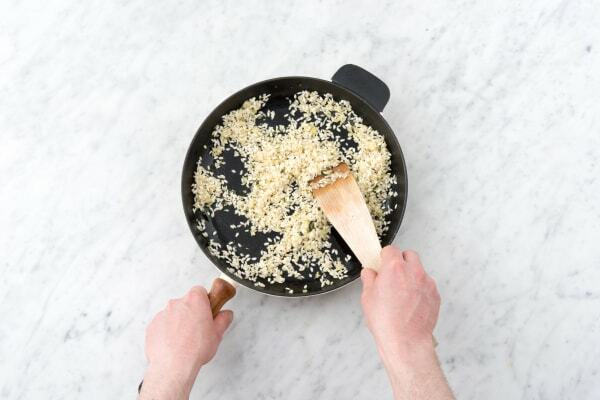 Allow rice to absorb most of the stock before adding more. Continue until al dente and creamy, 30-35 minutes. Trim mushrooms, then cut into ¼-inch-thick slices. Zest lemon until you have 1 tsp zest, then cut into quarters. Pick parsley leaves from stems and roughly chop. Heat a drizzle of oil in another large pan over medium-high heat. Add mushrooms and season with salt and pepper. Cook, tossing, until crisp and browned, 4-7 minutes. 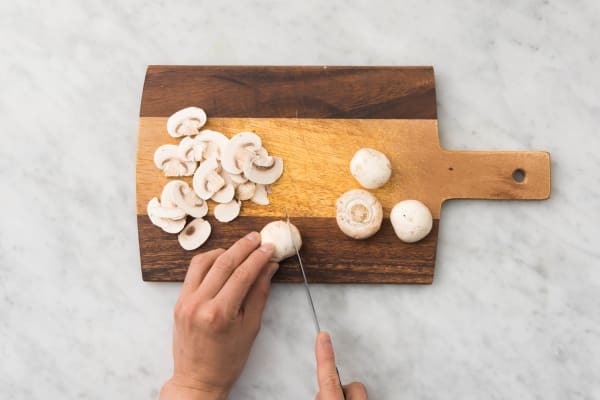 Remove mushrooms from pan and set aside. Wipe out pan and heat a large drizzle of oil in it over medium-high heat. Pat scallops dry with a paper towel and season generously all over with salt and pepper. Add to pan and cook until browned and just firm, 3-5 minutes per side. Remove from pan and set aside, covered, to keep warm. Wipe out pan again and place over medium heat. Melt 2 TBSP butter in same pan. Stir often until butter starts to brown, about 3 minutes. Stir in half the parsley and a squeeze of lemon juice, then immediately pour into a small bowl. 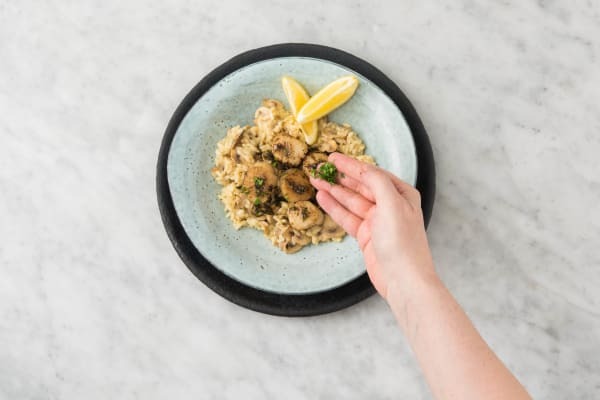 Once risotto is al dente, stir in mushrooms, lemon zest, Parmesan, 1 TBSP truffle oil (we sent more), 1 TBSP butter, and a squeeze of lemon juice. 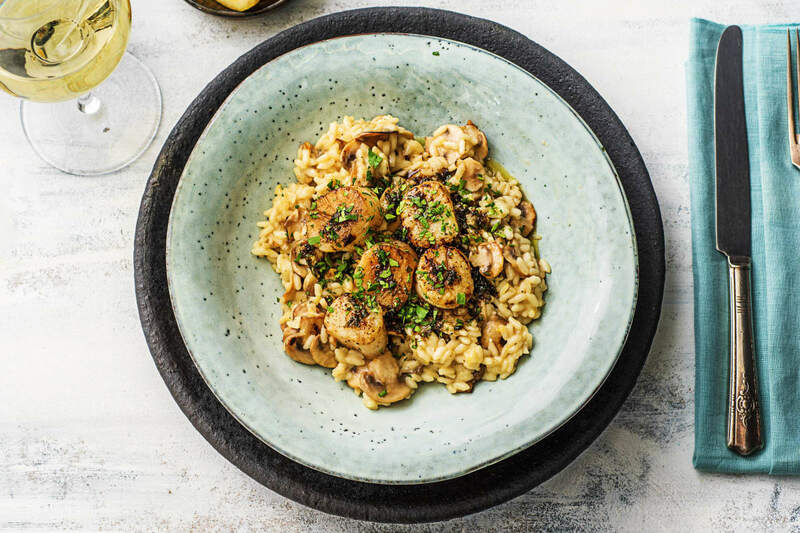 Season risotto with salt, pepper, and more lemon juice (to taste), then divide between bowls and top with scallops. Drizzle with brown butter and remaining truffle oil (to taste). Garnish with remaining parsley. Serve with any remaining lemon quarters on the side for squeezing over.